Mikey, Mo, and Jeff were over to play some Rock Band last night. Matthew, now 17 months old, decided to join in and show he's ready to join the band. Thankfully, Mom grabbed the camera. Well, I've finished my antibiotics and I'm finally feeling mostly better. Still need to shake some of the cobwebs out, I think. But, I'm happy to say I am finally feeling good enough to get things rolling again. There was a little trouble with getting The Greatest Fan Film of All Time to Stan Lee's people via the internet, so I put a DVD together last night and mailed it today. It's on its way! I've been in writing mode this week and have the groundwork laid out for what could turn into new animated short. It's still early, but I'm really excited about this idea. I'll update more as it evolves. I was feeling artsy recently and figured I'd try to illustrate one of my Mucinex/dehydration hallucinations from my hospital stay. 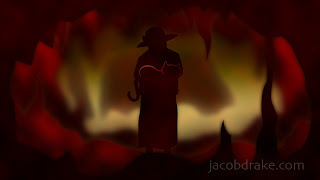 I chose one where my hospital room wall appeared to be a hellish cavern with an old lady holding a cat standing in the middle of it. Mom and I went and saw the new Star Trek movie yesterday. I've never been a Star Trek fan, but I thought it was pretty good. A decent start to my summer movie-going season. Personally, I can't wait for Terminator Salvation. Not much else going on at the moment... I'm boring.